i-MiEV with a bright yellow kayak on top drew a lot of attention and provided rides. Ford Northampton brought a FUSION ENERGI, the only plug-in EV on their lot. BMW West Springfield generously brought an i3 (for test rides/drives) and an i8 (for eye appeal). A Chevrolet dealership with no BOLTs brought two VOLTs for test rides/drives. With no Nissan dealer, information and a few rides/drives were provided by owners of LEAFs from 2013, 2014, 2016, and 2018. The event inspired the purchase of at least one new LEAF from our local dealer. Support from the Department of Energy, materials provided by Plug In America and gifts from Nissan were much appreciated. Three solar companies were on hand to discuss options available to EV owners who want to install domestic solar to further reduce their environmental impact. Their promotions were supported by several EV owners who charge with domestic solar. The weather was lovely and music by Sam Chevalier, Big Y's manager, was spectacular. A BOLT owner noted that the skillful guitar playing and wonderful singing increasingly distracted him from the task of promoting his vehicle. Big Y World Class Market was a terrific host partner. We chose to collaborate with Big Y, in part, to highlight the support for electric transportation they have demonstrated since 2013 when they began installing EV chargers at stores in Massachusetts and Connecticut. The use of a large portion of their parking lot as a safe and accessible space for our EV display and the availability of EV chargers made them an ideal host. Then they scheduled their in-store Autumn Fest to coincide with our event - a benefit to both. Pioneer Valley Electric Auto Association (PVEAA) and Big Y World Class Market Northampton welcome our neighbors in Northampton and surrounding communities to attend a free National Drive Electric Week event from 10AM - 2PM on Saturday September 8th. 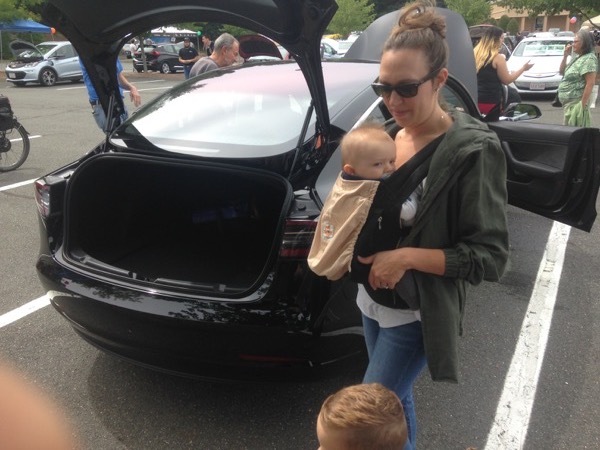 The purpose of National Drive Electric Week (NDEW) is to promote wide-spread adoption of plug-in electric vehicles (EVs) by providing people the opportunity to see and learn about them. This event offers a chance to talk with neighbors who have made the switch to an EV and to learn from representatives of federal, state and regional agencies and organizations about incentive programs that can cut the cost of EV ownership. Check out Plug In America's Used EV Buyers Guide. Everyone who wants to know more about EVs is welcome. PVEAA has promoted the use of sustainable transportation since 1996. Big Y Northampton opened in 1960 bringing to the region personalized service, great values, and fruits and vegetables from nearby farms. An industry leader in the promotion of local food and adoption of energy efficiency retrofits, Big Y distinguished itself in 2013 by beginning the installation of ChargePoint electric vehicle chargers at its stores. Inside the store, the Big Y Autumn Fest will feature local partners and live music, giveaways, and free samples of fresh local products to highlight the expansion of Big Y's selection of local produce and products. Outside, in the section of the Big Y parking lot furthest from the front of the store, local auto dealers will introduce new plug-in electric vehicles that are available in today's marketplace. See for yourself the similarities and differences between EVs. Drivers who are 18 years old or older and have a valid state driver's license may be eligible to participate in a Ride & Drive Event. Big Y staff will provide instructions on the use of the ChargePoint EV chargers that are installed in the parking lot. There will be music by an extraordinary talent. Entertaining and educational activities will be available for children of all ages in the Solar Shack. There will be exhibitions by numerous businesses and organizations during the event. We will also acknowledge the long history of support for EVs that has been demonstrated by Northampton and neighboring communities by publicizing data about those efforts. To display a privately-owned EV, please contact us directly at (stateofcharge@gmail.com) so we can plan for your arrival at the event and designate your parking space. Also, when you arrive at the event, please check in at the PVEAA tent near the Test Ride & Drive Staging Area to get tickets for our free raffle of EV-related items, and other splendiforous gifts. This NDEW event is free and open to all in Northampton and neighboring communities. Registered attendees report 474,591 electric miles driven.